Encouraging a collaborative workplace helps your business leverage the resources you have. Those resources are your employees. When you and your team collaborate effectively, you are able to be productive and stay motivated while working on team projects. In order for people to be successful and accomplish goals, there first needs to be goals set. When everyone is aware of the main goal for the company, they are motivated to work together because they are all working towards something bigger and know where they are going. Work with your team to write out your goals and put them up in your office so that you can visually see them. This way everyone is reminded of where the company wants to go, which also helps with decision making because you can evaluate whether or not an idea or plan is inline with the main goal. Part of what makes people so interesting is the fact that we are all different. We have different personalities, strengths, weaknesses, perspectives and ideas. These differences can be leveraged to achieve success. When you identify what people are good at, you can set them up for success by pairing them with appropriate tasks and roles that suit their strengths. This helps collaborate effectively by understanding the different personality types in your team so you can manage each type successfully. The very creative and “out-of-the-box” thinking people tend to be great at conceptualizing, while other personality types that are very structured and organized are great at planning and implementing. When paired together, these two personality types compliment each other well because one side envisions an idea, while the other makes it happen. The Myers-Briggs type Indicator is one example of a test that each team member can take to help them identify their personality type along with strengths and weaknesses associated with each type. After figuring out what each person is good at, you can assign tasks and responsibilities more easily. As mentioned above, when you know a person’s strength you can match that strength with a task that uses their ability. This helps empower each team member by creating a sense of importance. Each individual understands the role that they and their teammates play in achieving the goal, therefore, they are more respectful of each other while working together. The best part of collaborating is the ability to brainstorm as a group. Bouncing around ideas together can be the best way to come up with a solution. Personally, I think it’s the most fun part of the process. Hearing various perspectives from different personality types in your group can help spark and refine solutions that work well for everyone. While brainstorming, it’s important to encourage a positive environment that supports creative thinking. Effective brainstorming happens when everyone feels open and comfortable with sharing their ideas. Read these 7 Unique Brainstorming Techniques from Inc.
To keep the motivation going, let people know their ideas matter and congratulate them when a job is done well. When people receive positive reinforcement for what they do well, they feel accomplished and want to continue to do well. 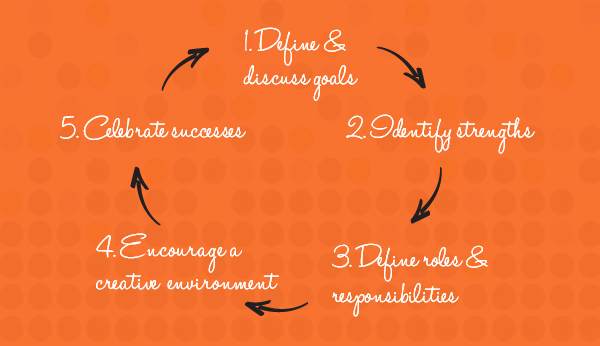 Use this upward spiral of positive reinforcement to keep the good work coming. When collaborating, people should feel supported by their team members and encouraged to keep moving forward. No one wants to contribute to a team discussion when they feel judged or that their ideas are not important. Let your team know when they have a great idea and encourage everyone to participate. Provide encouragement when people accomplish their tasks and positive feedback for ways of improving. Finally, celebrate when as a team, you have reached your goal. After celebrating that a goal was reached, you can repeat the cycle by defining the next set of goals. You can use past collaborative projects to identify what people did well and make modifications based on newly identifies strengths and challenges. Throughout this collaborative process, maintain an emphasis on communication. Keep the lines of communication open so that everyone feels comfortable with contributing ideas and helping to solve problems that happen along the way. It’s good to have a leader of a team, but everyone should feel like they have a voice that matters. Need a tool to keep track of your goals and the steps to get there? Try Daylite to manage projects and tasks as a team.